The daughter of Dracula showcases a freaky fabulous flaw with a trendy teen skirt that opens to create boo-tiful bat wings. 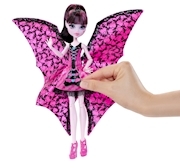 Simply pull down the lever on Draculaura™ teen doll's bodice to see her shimmery pink overskirt unfold into body-sized wings. Push the wings down to return to a "regular" ghoul. Then do it again to repeat the wow moment. Shimmery pink on the outside and decorated with a bat and heart print on the inside, the giant bat wings help stories take flight. Both looks are gore-geous. 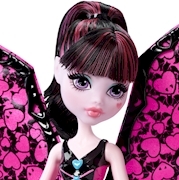 When dressed as a teen, Draculaura™ has a pink bodice with white ruffles and a black bow tie, a pink skirt with heart print and gathered overskirt. As a bat, her bodice is opened to reveal a lace-up corset in pink, blue and black with bat details. Pink shoes are fangtastic with either look. Recreate favorite stories or tell new tales with this uhh-mazing doll. Repeat the transformation for expanded storytelling, display and creative expression. Fly into fun -- over and over again!